With two days in Hong Kong it would have been a sacrilege not to try one of the island's two 3 star Cantonese restaurants. Given the last-minute nature of the trip, we were left with few options so we settled on a lunchtime reservation at T'ang court. 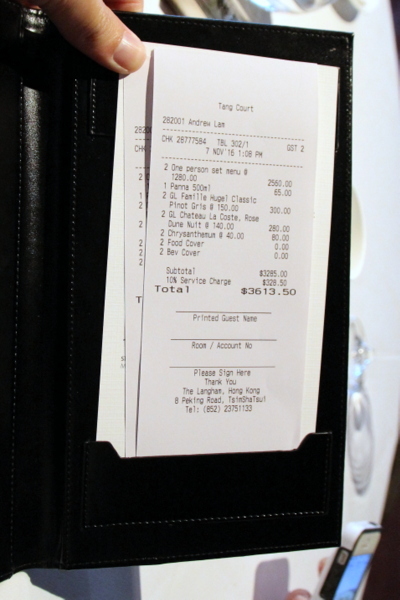 Fortunately when we arrived we were informed the restaurant offers its full menu at lunch as well as dinner. The dinner menu features several tasting menus as well as a bevy of a la carte options. My girlfriend and I each opted for the One Person Set Menu which our waiter said was the best way for two people to fully experience the chef's cooking. 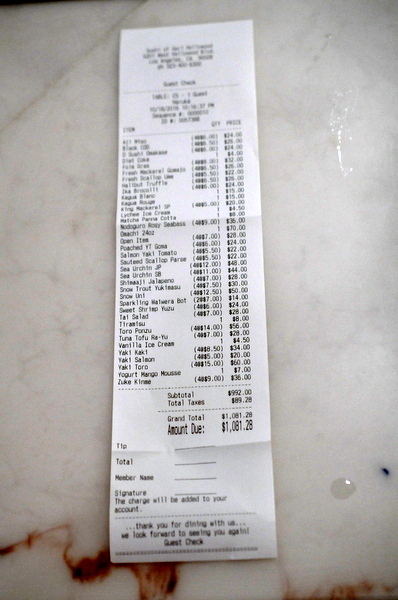 Sadly we didn't get to try the restaurant's dim sum offering but there's always next time. First up was a crab shell stuffed with shredded crab meat, cream, and onion then baked in a golden crust. Breaking through the crispy exterior revealed a rich creamy mass of shredded crab and onions. 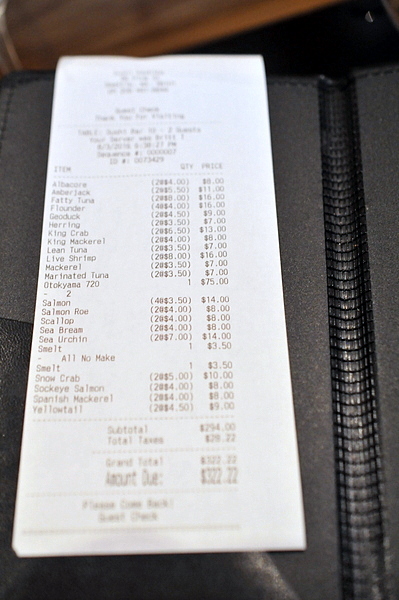 Our server made a point to stress the crab meat was fresh (which should be a given at this price point) and indeed the vibrant salinity seemed to back up his assertion. The bits of onion do a nice job adding a bit of sweet zest to the potent heft of the crab. 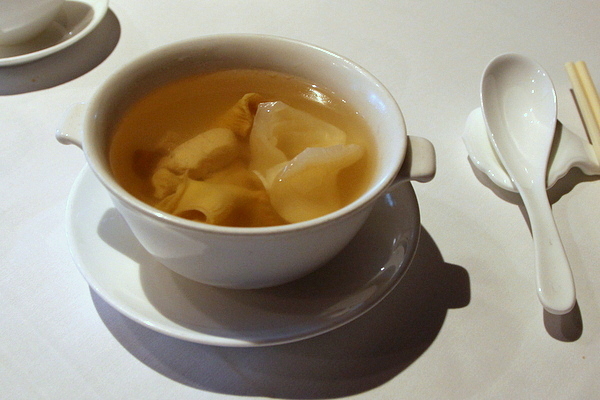 The soup course consisted of a light broth of chicken and ham, infused with a clean vivid umami from the fish maw and whelk that was very reminiscent of a milder version of shark's fin soup. The soup comes filled with the constituent ingredients for some textural contrast but having been thoroughly boiled there wasn't much flavor to any of them. 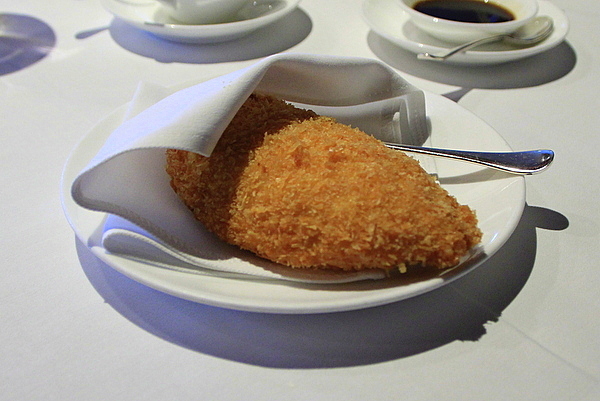 This course was quintessential Cantonese luxury. 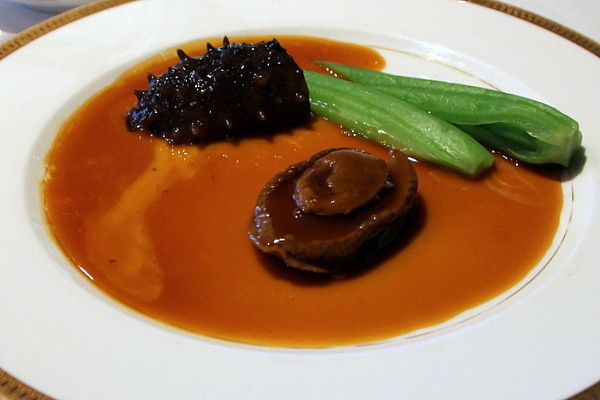 The abalone was braised to a uniformly supple and tender texture with a deep aggressive salinity while the sea cucumber had a silky gelatin like texture both coated in a glorious golden brown sauce. Like the seafood, the accompanying vegetables were cooked perfectly and the resulting texture was tender but still retained a bit of crispy snap while the subdued bitter flavor was a pleasant contrast to the multifaceted savor of the abalone and sea cucumber. I was looking forward to the fish from the moment I saw it on the menu and the fragrant aroma that accompanied it had me salivating in anticipation. 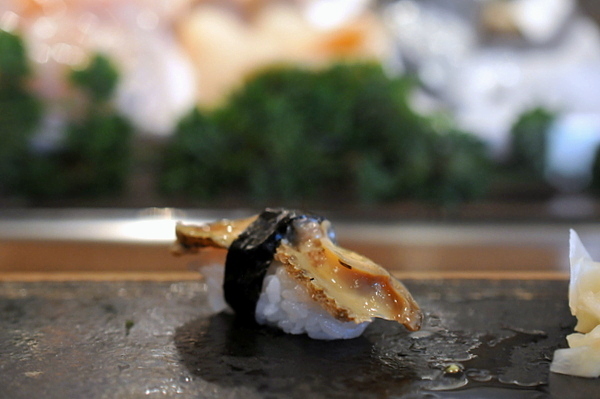 The thick dense flakes are wrapped in a delicately thin crispy layer that is beautifully infused with soy sauce. Though my tastes tend to run toward lighter density fish the perfectly fried grouper was a very welcome change of pace. I've never been a fan of lobster E-fu noodles, as I typically find both the noodle and lobsters a bit overcooked and mushy. I had high hopes that T'ang Court would be the restaurant to break that trend but they only partially succeeded. 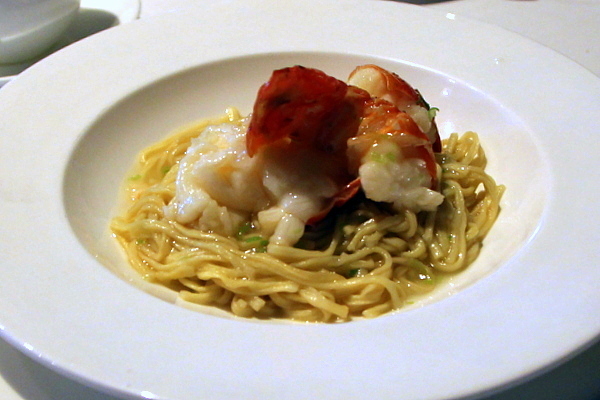 The lobster was a touch overcooked but the noodles had a much firmer texture and the lobster stock and scallions made for a delightful accompaniment to the noodles. 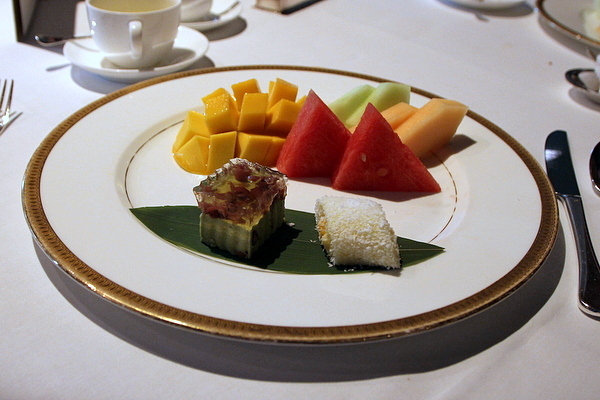 The fresh fruit was somewhat underwhelming, not particularly sweet and a touch under ripe, but the desserts were quite enjoyable. First up was a red bean in gelatin over a green tea base that presented the classic flavors in a unique textural package. Besides that was a little morsel of coconut and some unidentified filling that was sweet and paired nicely with the fresh coconut flavor. Our meal at T'ang Court was the most complete Chinese dining experience I've ever had, but despite that I still was left a bit wanting. The one-person tasting menu is a touch seafood heavy but I suppose that can't be helped given the Chinese emphasis on ingredients over technique. That isn't to say that the cooking lacked technique, indeed this is one of the most polished Cantonese meals that I've ever tasted. All of the dishes were perfectly executed, the service was warm and attentive, and the decor was both elegant yet inviting, but for all of that I never really felt the wow factor that made me feel like I was dining at a 3 Michelin Star restaurant. 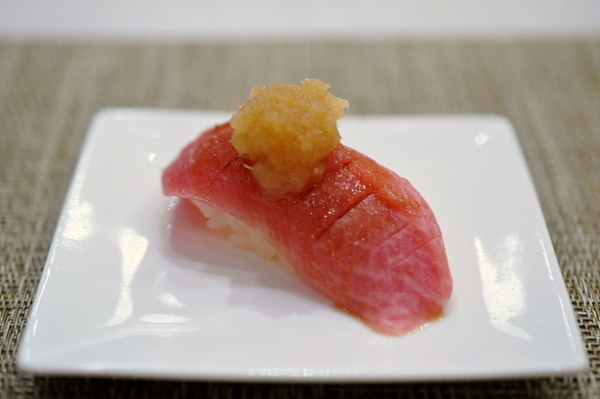 Despite being something of a sushi fiend, my experience is decidedly Los Angeles-centric so when I heard Sushi of Gari, a Michelin-starred transplant from New York, it was an easy must try. My friends and I came for a late dinner after the pre-show Pantages crowd had left and we pretty much had the place all to ourselves. This was a rather traditional preparation of Nambanzuke, the fish is first fried then marinated in vinegar and soy sauce and served chilled, resulting in firm dense flakes of fish infused with a light tang of sweet soy and vinegar. Hagashi Toro is a relative rarity on account of the amount of labor that goes into it. 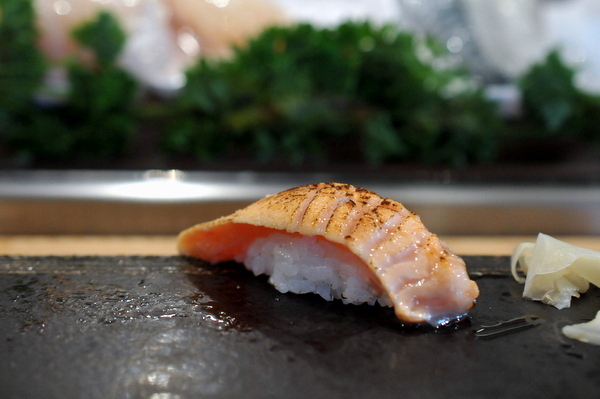 The meat comes from a sinewy part of this fish and requires a great deal of effort to extract. 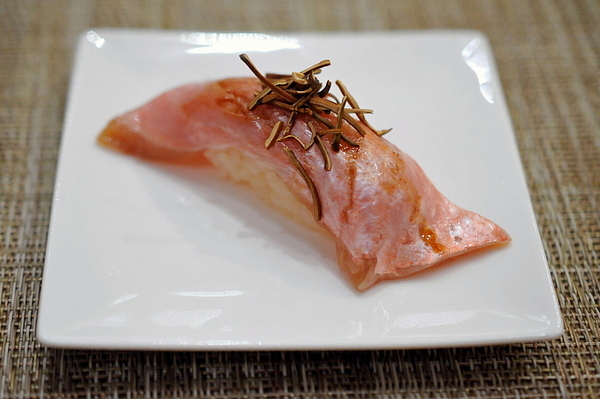 The resulting morsel wasn't as opulent as an Otoro but still had plenty of flavor and a more complex delicate texture. 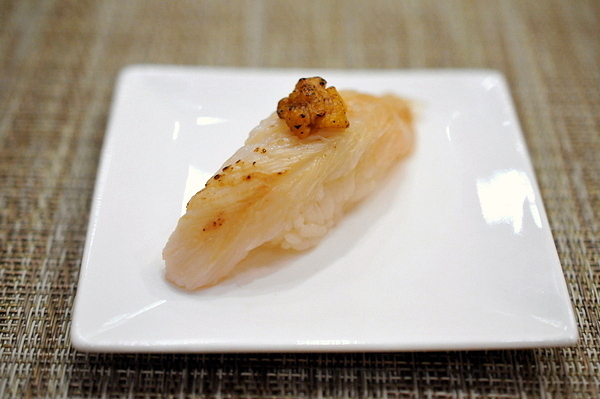 The dollop of daikon added an upfront pungent sharpness that further balanced the fish. The snapper was one of the most impressive bites of the night, coated in a slick oily pesto and topped with vegetables and leaves that exhibited a complex blend of fresh zesty verdance and an earthy nutty flavor. This was my first experience with snow trout and the fish doesn't disappoint with a pillow-y litheness that was an absolute textural joy. I was a bit taken aback by the decision to pair the fish with applesauce but the Nagano apples worked well imparting a mix of smoke and gentle fruit-laden sweetness. 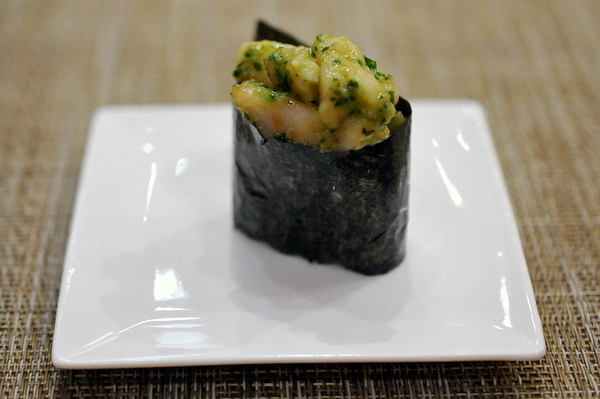 The sweet shrimp came with a more conventional topping of yuzu infused miso. 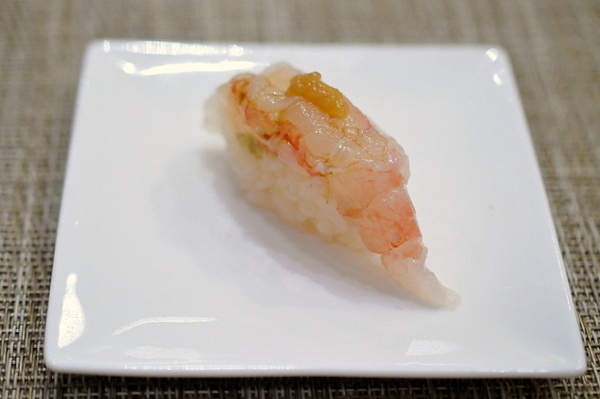 The raw Spot Prawn was a touch softer than I'd have liked but still quite delicious especially with the enveloping aroma of fresh citrus. The grilled Sawara was keenly enjoyable. The fattiness of the fish develops a pointed smokiness deftly augmented by the earthy mushroom. 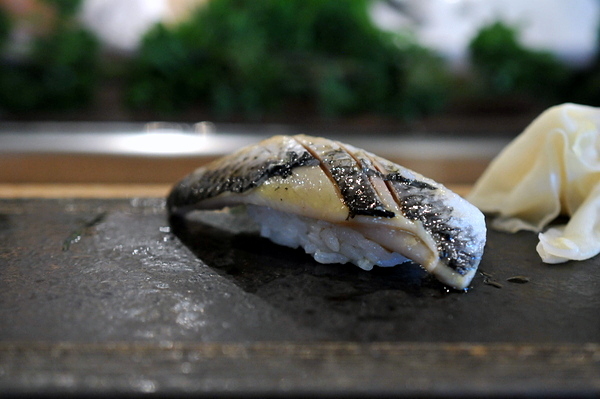 Besides the charred smoky exterior, the raw mackerel has a distinct warm fleshiness. 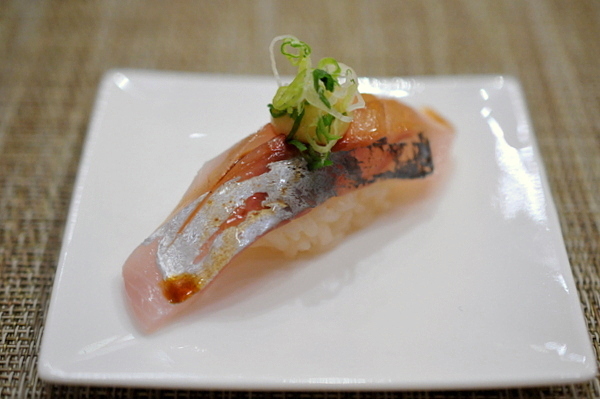 The Shima Aji was another of the evening's standouts. The bits of diced jalapeno are the perfect foil for the fish, succulent crispness to balance the jellied snap of the Aji and pinpricks of heat to counter the oily heft of the fish. Despite sounding positively pedestrian this was arguably my favorite bite of the night. The warm topping of soft tomato explodes with a blend of savor and fresh onion reminiscent of Chinese steamed fish and the warmth of the tomato helped to heighten the natural lushness of the fish. Akami is a subtle delicate fish that typically doesn't play well with others so I was surprised that the tofu and chili worked as well as it did. The mild tofu was akin to a creamy burrata while the chili oil fit surprisingly well with the fish and soybean. 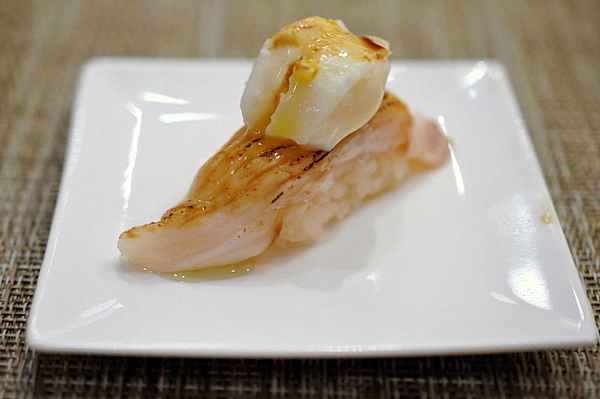 The thick slab of delicate Hokkaido scallop came topped with a pink dollop of plum sauce and the pungent flavor of the sauce coupled with the scallop's intrinsic sweet salinity was eerily similar to strawberry ice cream. This was arguably the most familiar course of the night the high fat content of the fish yields a pungent smoke with a sharp twang. The sweetness of the miso is apparent up front but the fish has a bitter finish that serves as an effective counterpoint. 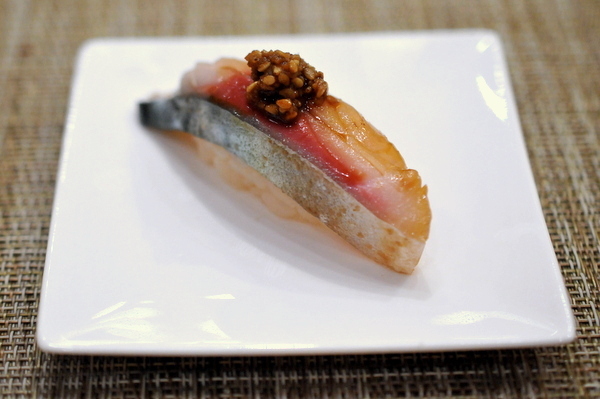 Unlike the typical Mackerel preparations, this one was marinated with soy giving it a distinct saltiness and moderating the natural fish oils. The Snapper came marinated in some form of fish broth which accentuated the fish's naturally snappy texture while adding a deep-seated savoriness that was further emphasized by the umami funk of the dried kelp. Personally I think a quick sear to soften the sinewy fish would have made the dish more cohesive. 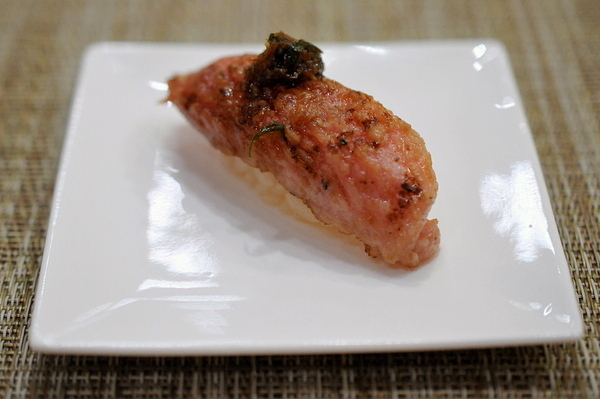 I was thorough impressed by this dish, a gunkan maki filled with scallop abductor muscles that so often go to waste. The abductor often discarded on account of its tough texture, but sauteed and served with parsley the little bits were shockingly similar to a classic French escargot recipe, firm and savory with a heady aroma of herbs and garlic. 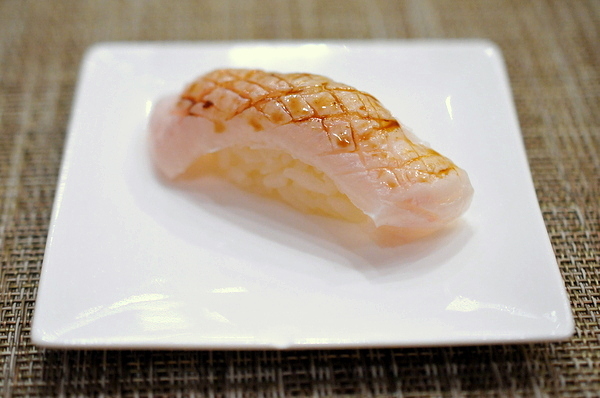 Like the salmon we had earlier, Gari's yellowtail is a wonderfully fresh take on classic nigiri fish. 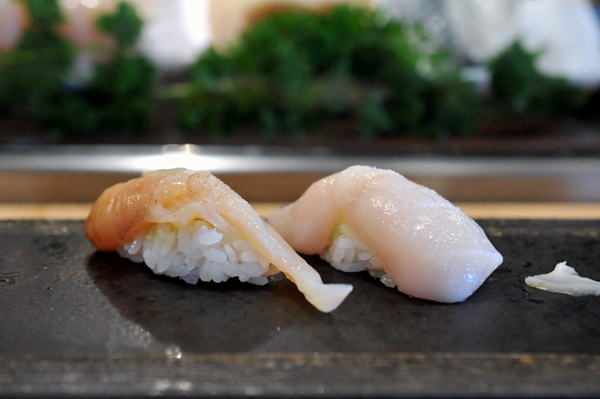 Ever so delicately poached, the fish has a touch more flakiness, but a supple core threaded with rendered fish oil. I appreciated the onion and radish though I could have done with less of the sesame which imparted an odd peanut butter-like flavor. Gari continues to defy convention, paring a rich oily Aji with sweet miso. While I appreciated the concept, the execution was a bit jarring. Also called Akamutsu, the Perch was one of the most textually interesting pieces of the night. Lightly seared on the top the fish almost has layers of texture ranging from the hard snap of the skin to a soft even fleshiness. 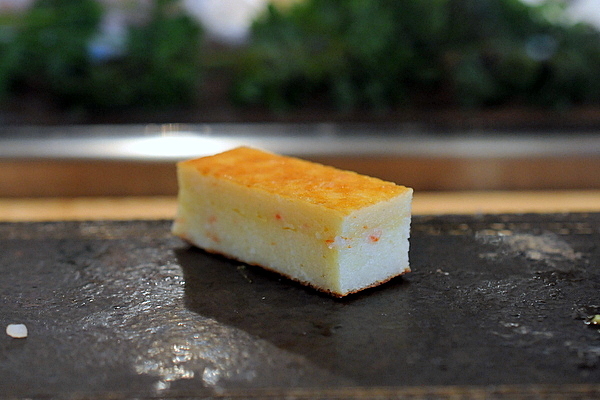 The interplay of the smoke and fat is highlighted by the citrus bite of the yuzu kocho. 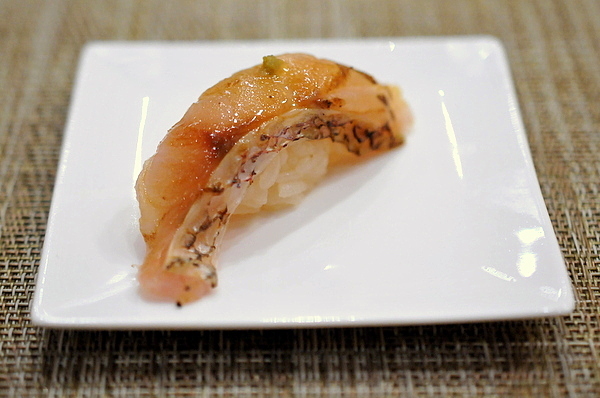 Only the second truly conventional nigiri of the evening, but definitely an enjoyable one. Easily one of the most visually distinctive squid presentations that I've ever had, the light sear gives the squid a slightly dry and tough exterior that leads to a lean snappy base. The mildly herbaceous topping didn't add much to the dish but it didn't get in the way either. I've always found Snow Crab a bit stringy and less impressive than King Crab, but this preparation was absolutely sublime. The thicker cut allowed for a feathery soft texture while the flavor was a mix of cooked savor with intrinsic shellfish sweetness. 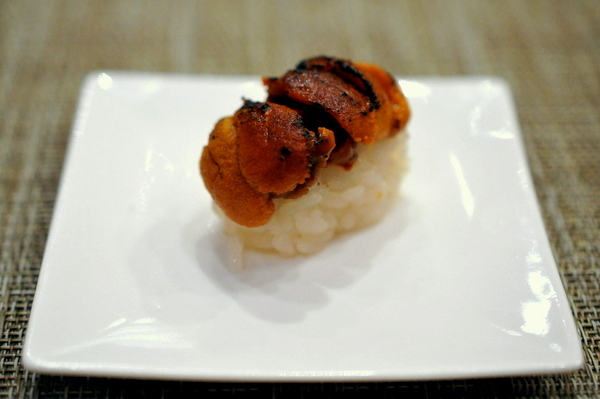 The bit of cooked uni on top added a touch of pungent funk to the crab. The seared salmon was far less impressive than the earlier preparation. Made from a leaner variety of the fish, the searing imparted a dry hammy smoke fitting to the more austere texture. With plenty of butter this was more akin to an Oysters Rockefeller than anything I would have expected to find at a sushi restaurant. Naturally we couldn't leave before trying the uni. The quail egg was a remarkably clever addition, the slick texture masking the strongest elements of the urchin roe and resulting in a balanced sweet richness that built over time. 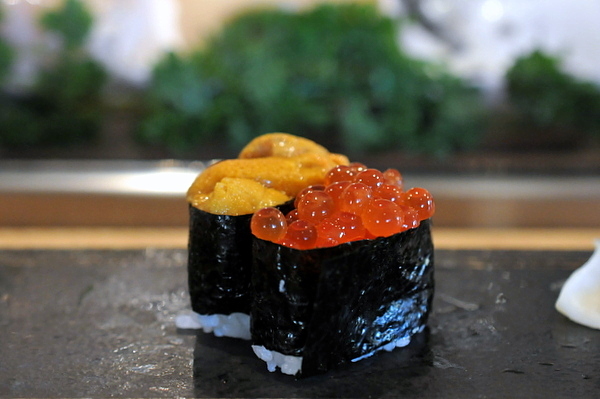 The Hokkaido style uni was one of the few bites that didn't come topped with some other element and with good reason. The reddish-orange roe had a much deeper saline-focused flavor that reached new heights when kissed by the blowtorch. After already trying the Hagashi Toro, I was exceedingly pleased when Také-san presented us with another piece of rare toro. As the name suggests, the Kama Toro comes from the area around the collar and is prized for its high fat content and deeper flavor. The searing softens the meat while simultaneously rendering some of the fat and browning the exterior, another contender for bite of the night. Its been a while since I've had halibut with truffle and Gari's version hits all the right notes with a supple fleshy mouth feel and heady truffled musk. The silky runny yolk of the quail egg was the proverbial cherry on top, adding a viscous sensuality to the mix. This was a specific request by our party and came with a simple brush of soy rather than the more elaborate accompaniments of many of the evening's earlier nigiri. Také-san scored the tough fin muscle to tenderize it though personally I would have preferred a quick flash of the torch to soften things up. Our final piece was a strange sight that would have been more fitting in a French restaurant. 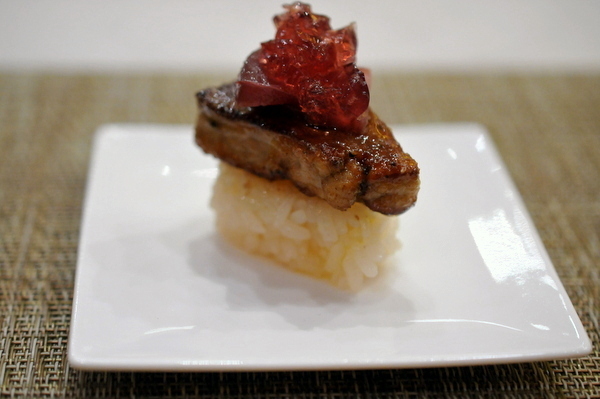 The foie was a touch dry though the restrained sweetness of the compote was a superb pairing. 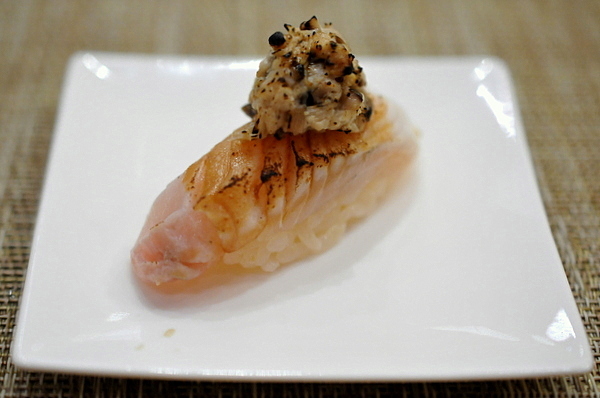 I've always been leery of sushi restaurants that pair unconventional ingredients with the fish, as that seemed to be a smokescreen to hide substandard fish or a crutch to help newbies by masking the true nature of the fish. Sushi of Gari manages to pull off the use of unique accompaniments to impart unique flavors while still letting the intrinsic character of the fish shine. I did notice the rice was a touch denser than I would have liked, mildly annoying but not enough to overshadow the distinctive experience Gari offers. I highly recommend going after the pre-theater dinner rush for a more intimate experience but do it fast as I have a feeling once word of this place gets out, it won't be so easy to find a seat. Having spent the last 46 years on the cutting-edge of the Seattle sushi scene, Shiro Kashiba is without a doubt Seattle's godfather of sushi. Back in 1970, Shiro established the first full service sushi bar at Maneki a Japanese restaurant that dates back to the turn of the twentieth century. After working there for a couple of years, Shiro struck out on his own and opened his first restaurant, Nikko. He ran the restaurant for the better part of a generation before selling the name to the Westin in 1992. He remained with the restaurant for little more than a year before the corporate grind drove him tender his resignation. In 1994 he started the eponymous Shiro before feeling the 20-year itch and retiring again in 2014. Apparently retirement didn't sit well with the venerable Kashiba and it was little more than a year before there were rumblings of a new restaurant in the works and in late 2015 Sushi Kashiba was born. 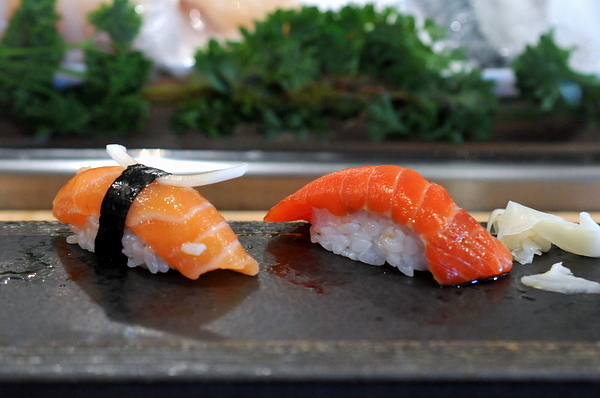 Situated one block north of the Pike Place market the restaurant has a small a la carte seating area as well as a comfortable well appointed bar, but to get the full experience omakase at the sushi bar is a must. Seating at the bar is strictly first come first serve so though I recommend you show up before the restaurant opens or be prepared to wait. 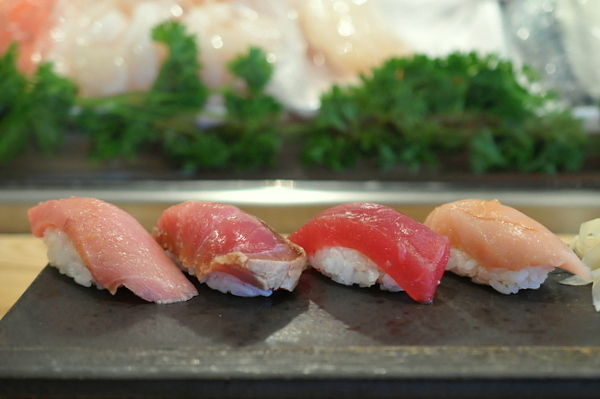 Omakase meals typically start with lighter fishes like halibut or snapper but Kashiba chose to open with a quartet of tuna. Starting on the right, we have a tender slab of albacore, the delicacy of the fish's texture is heightened by it's abundant oiliness. 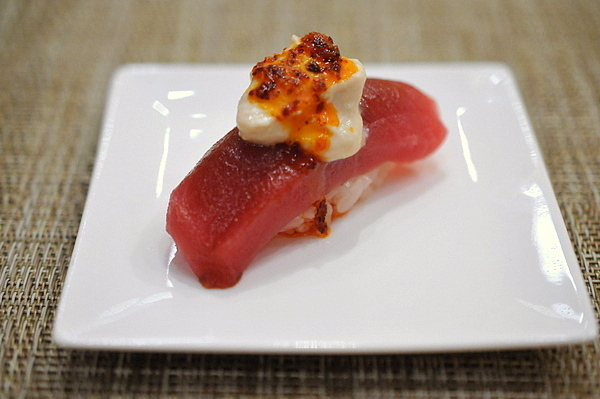 Besides the Albacore was a piece of classic bluefin tuna, the fish was on the lean and steely side with a soft bite of wasabi on the finish. Next up was marinated tuna, with a softer suppler texture and intrinsic salinity, this was was far superior to the standard Akami. Last but certainly not least was the toro; utterly different from its leaner cousins, the decadent oiliness suffuses the palate and lingers long after the tasty morsel is gone. The snapper had the classic mild flavor, but was a bit flabby for my liking. 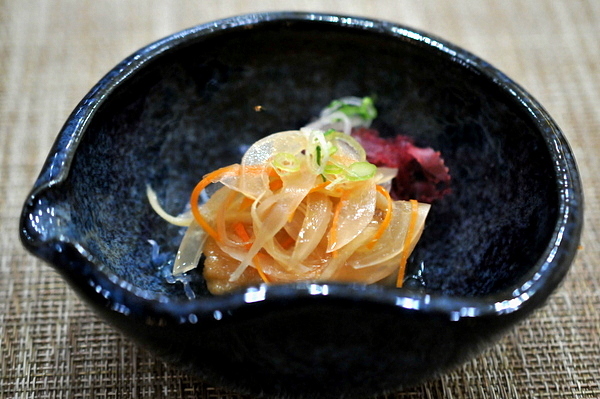 The halibut was more appealing with a touch of crunchy firmness and a bold spicy bite from the pickled radish. 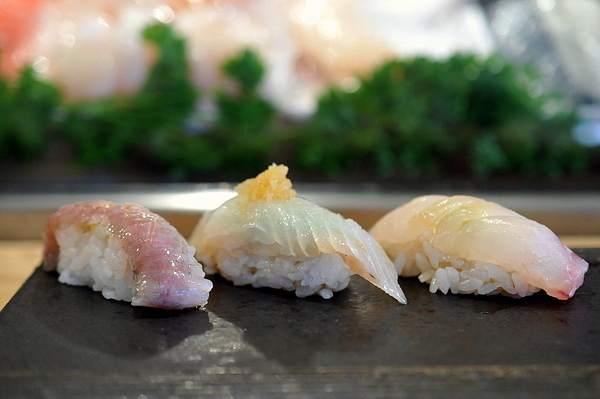 The Engawa was by far the best of the trio with a dense muscular chewiness and deeper flavor not seen in the other two white fish nigiri. 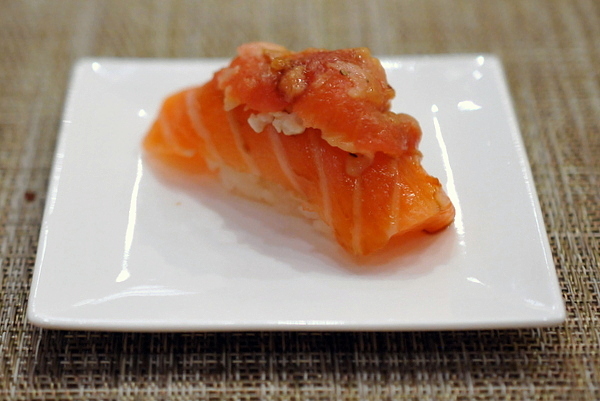 The duet of salmon opened with a richly colored sockeye salmon, which was markedly leaner with a touch of steeliness instead of the buttery sweetness of the more common King Salmon. 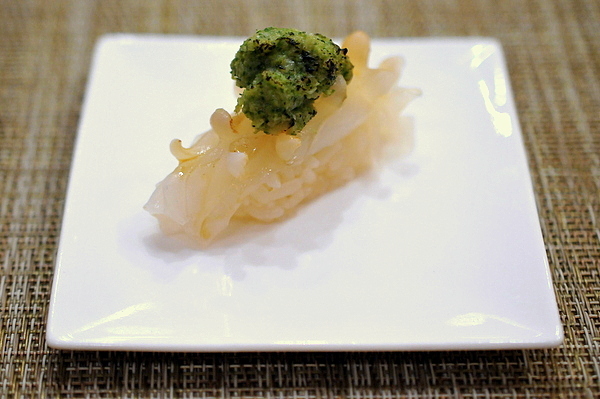 Kashiba's preparation of Sake enlivens the ubiquitous sushi fish with a crisp succulent sprig of sweet onion and a nutty strip of nori. If the regular salmon had plenty of oily goodness, the belly raises things to absurd levels, but the searing helps burn off some of the oil and infuses the fish with a rush of heady smoke. It would be a sin to visit Seattle and not have fresh Mirugai. 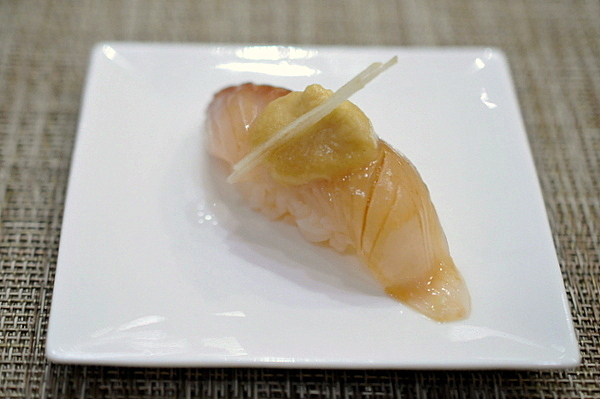 Kashiba's preparation has a multifaceted dense yet snappy texture as well as a perfectly balanced sweet saline tension. 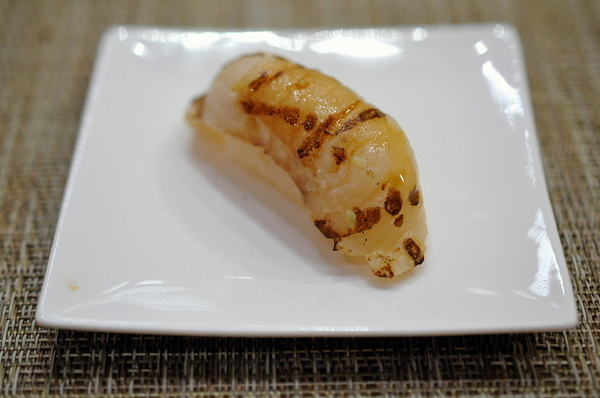 The Hotate was a little more forward with a straightforwardly buttery sweetness as well as a silky soft texture. I was expecting plenty of oily goodness from the trio of mackerel and the fish certainly didn't disappoint. 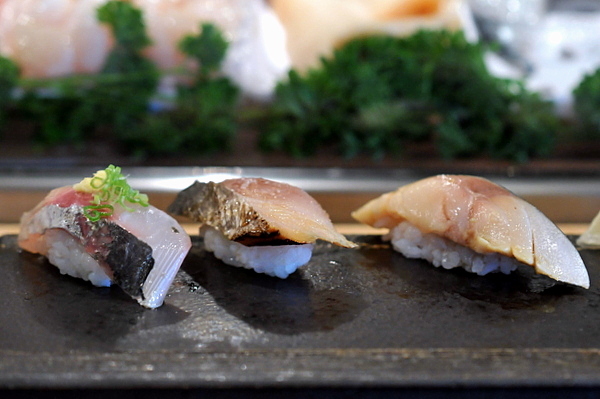 Starting from the right was basic Mackerel, texturally the leanest of the three fish, with a touch of sliminess around the traditional dense slightly dry mouth feel. 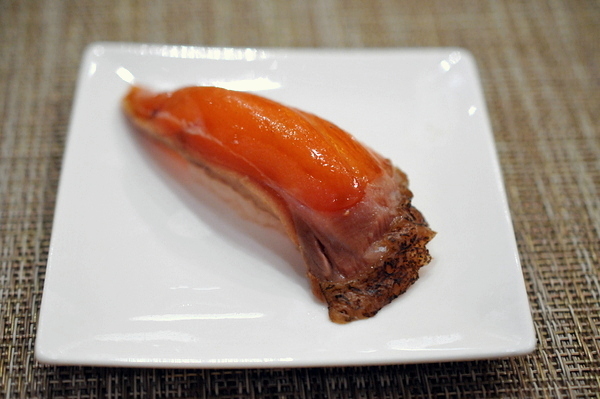 The Sawara had a smoked hammy flavor and consistency with the pliant chewy adding a contrasting textural note. 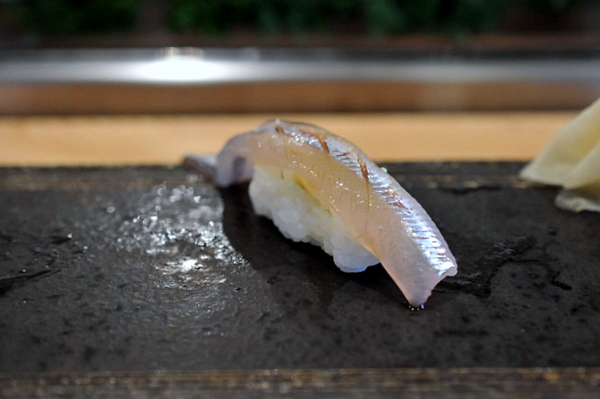 The Aji was my favorite of the trio, snappy and light the Aji also evidenced the most nuanced slate of flavor. I actually mistook this for Sayuri when I first saw it but this was actually a form of smelt. 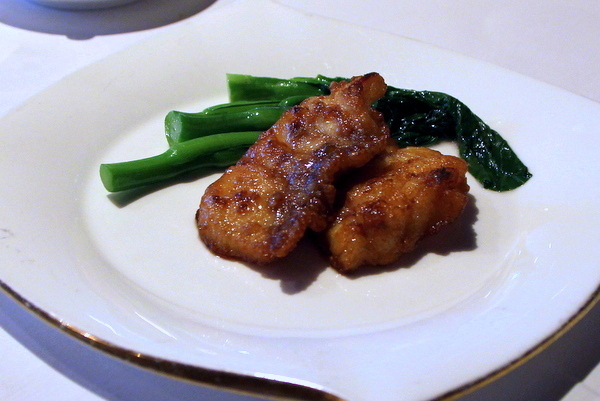 The fish has a pleasing jellied texture and mild flavor that worked quite nicely with the spicy grated ginger. 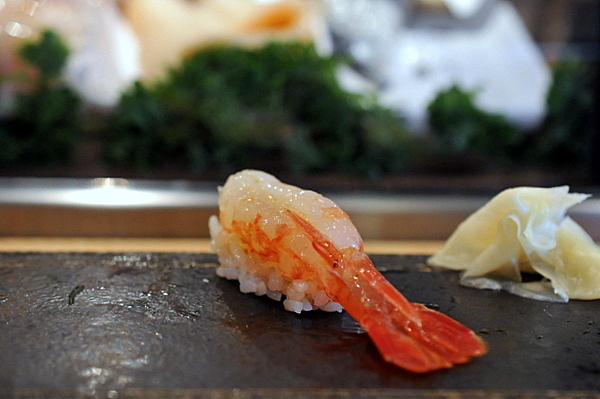 Having finished the basic omakase our itamae began taking requests. 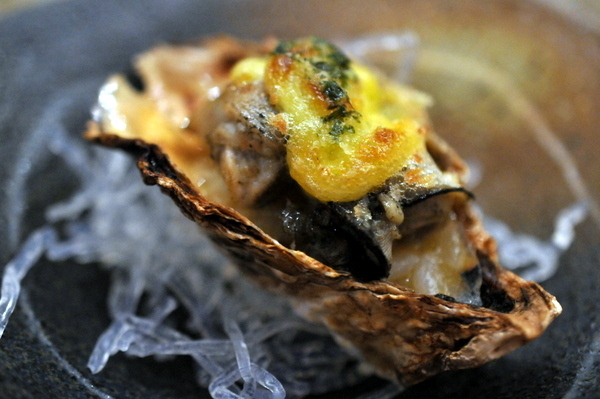 When we asked for Kohada he informed us the season had passed but he offered us their house marinated herring instead. 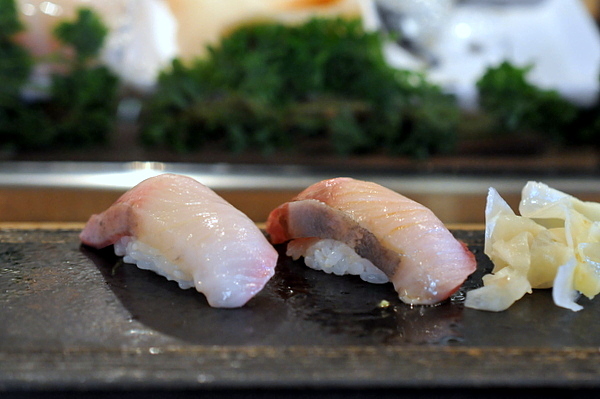 The fish has the same pungent flavor of vinegar and fish oil but with a softer more succulent texture. Next up was a classic duet of roe. 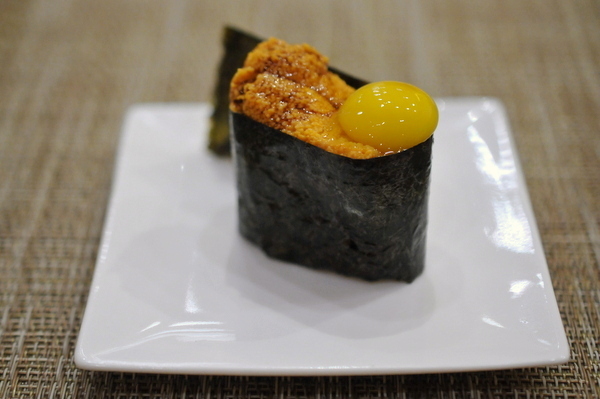 The uni hailed from Hokkaido and golden pouches of creamy sweet richness left me wanting more. The Ikura was served a bit warmer than I was used to but despite the temperature, still had a delightful pop and classic smoky flavor. 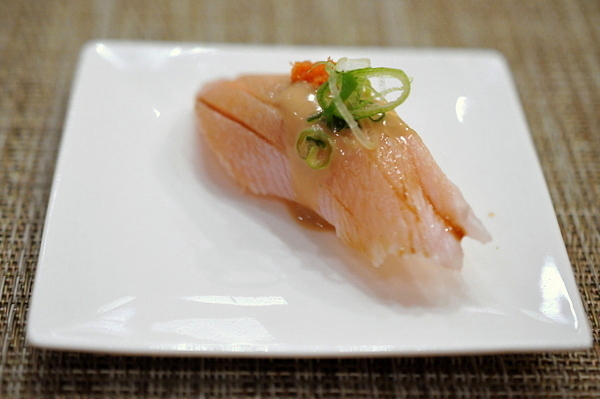 In my sushi infancy Hamachi was my go to fish though I hardly ever order it anymore. The classic sweet oily twang reminds is still quite appealing but the soft fleshy texture feels a bit one-dimensional. 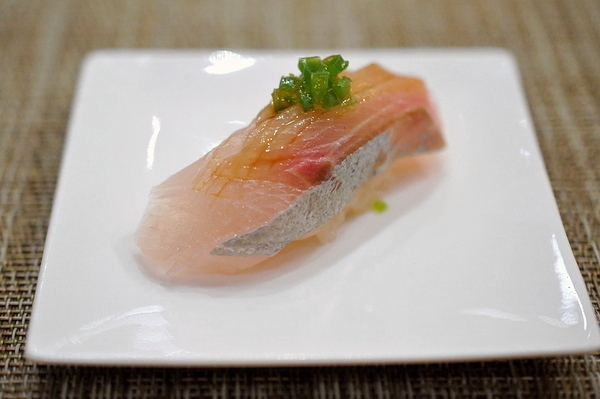 The Kampachi was definitely more impressive on that score offering a slick and snappy texture accompanied by a similar but milder flavor as the Hamachi. This was my first time having Tokobushi, a species of abalone that tends to be smaller than the more commonly found Awabi. The Tokobushi has a softer more pliant texture and milder flavor that lends itself well to showcasing the dashi it was cooked in. For our final savory we opted for nigiri Deadliest Catch style with a delectable duet of king crab (right) and snow crab (left). 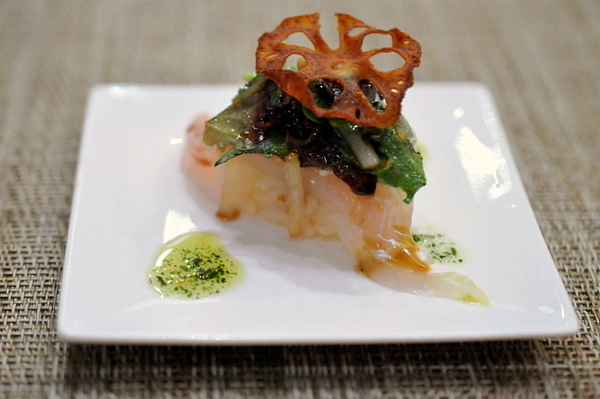 I tend to favor King Crab over Snow Crab and Kashiba's offerings continue that trend. The Taraba Gani has a meatier texture and its flavor tends to be a touch sweeter where the Zuwai Gani has a leaner stringer feel and earthier flavor. The meal closed out on a strong note with a dense cake-y tamago that deftly balanced the smoky-sweet eggy flavor with a slight hint of savoriness. Given Kashiba-san's pedigree and reputation I was expecting a transcendent experience and came away a bit wanting. Perhaps my expectations were unrealistically high as the fish quality was consistently very good and aside from the overly loose rice there weren't any overt flaws. Ultimately, I have to say that a trip to the sushi bar at Kashiba is a no-brainer for any sushi fan visiting Seattle. 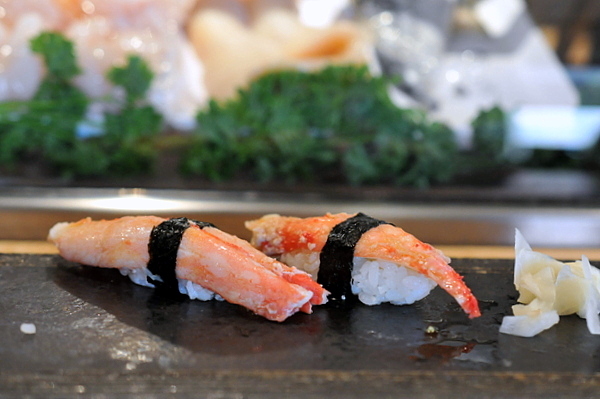 My girlfriend and I had planned to have back-to-back dinners at Sushi Kashiba and Shiro. Having missed the first seating at Shiro, we opted to grab a small bite at Kashiba to tide us over. 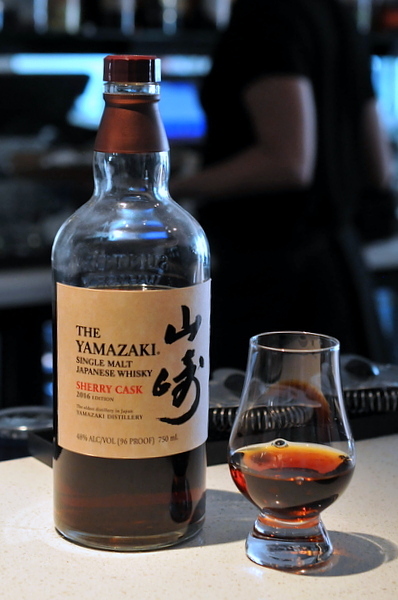 I almost couldn't bring myself to order a shot of the Yamazaki Sherry Cask, but I figured this might be my only opportunity to try it. This extremely limited bottle became even more elusive after it was named World's Best Whisky by Jim Murray in 2015. This year a mere 26 of the 5,000 bottles released were shipped stateside and apparently Kashiba-san had the pull to score one from his distributor. The deep reddish color and slightly viscous texture are in keeping with an aged Sherried Whisky while the aroma offered notes of syrup and dried fruit the palate has a nuanced restraint that shows off the sherry without being drowned in it. What surprised me most about the drink was how much my girlfriend, who typically likens Whisky to paint thinner took to this dram. However at $2,000 a bottle, I don't feel inclined to indulge her budding interest in Whisky any further. Being in Seattle the Kumamotos were an absolute must. 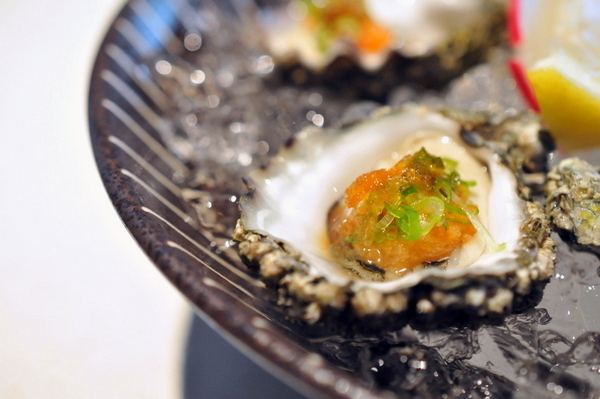 Fished fresh from the local waters the sweet briny morsels are coupled with a punchy tang from the ponzu vinegar. 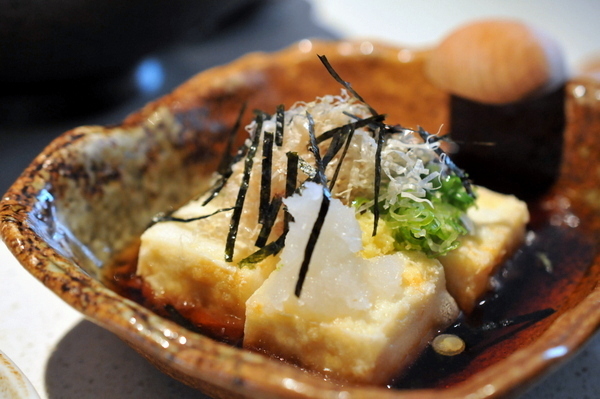 One of the more elegant preparations of Agedashi tofu I've had in a while. The tofu was brilliantly soft while the broth had a brooding weighty savor perked up by the bitter daikon and bite of the ginger.